Altered Instinct: BOOK FEVER: A book that changed my life, with author Leo McBride. 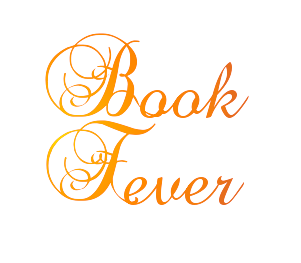 BOOK FEVER: A book that changed my life, with author Leo McBride. BOOK FEVER is a new, occasional column featuring authors chatting about books that made an impression on their lives. 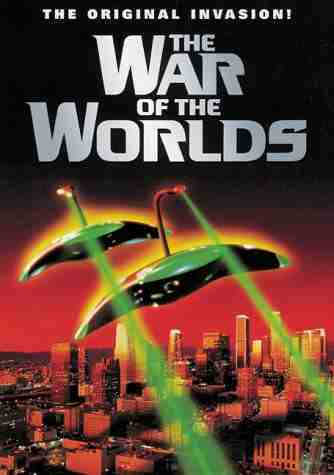 To kick the column off, blog host Leo McBride puts the emphasis on science fiction and takes a look at The War Of The Worlds, by HG Wells. You might think it would be easy to pick out a book that could be described as having changed your life. Not so. The trouble is there are so many that have changed my life, broken my heart and made it whole, strapped me into rocket ships and fired me into the sky or watched as I crashed to the ground and the world about me. This could be an article about Ray Bradbury - and really, just pick any of his off the shelf and you can rest assured it's done a number on my emotions. This could be an article about Arthur C Clarke and the magnificent realism of the worlds he constructs. This was very, very nearly an article about Galactic Warlord - the first of the Last Legionnaire series by Douglas Hill, which as a young boy I devoured whole from the shelves of my local library, and which was only ruled out because those years are long ago now and the memory of those stories is a little hazy. 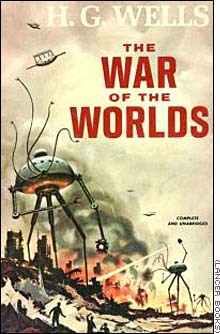 Those shelves fed my early love of science fiction - and fantasy, and no small measure of horror - but one of the books that sat there, with potential simmering away under its cover waiting for the reader to discover it, was The War Of The Worlds, by HG Wells. There's likely been dozens of covers to the Wells classic over the years. Hundreds, maybe. But the one from the shelves of Acklam Library, where I scurried along to find words, words and more words, was a plain affair. A blank yellow wraparound cover, with black writing marking out the author and the title, then wrapped in a slightly loose plastic dust jacket that did its best to obscure what was underneath. I had heard about the book even at that young age. I knew of the old 1953 movie - though it was the book I would read first before seeing that later. From the beginning of the book, I was hooked. "No one would have believed in the last years of the nineteenth century that this world was being watched keenly and closely by intelligences greater than man's and yet as mortal as his own; that as men busied themselves about their various concerns they were scrutinised and studied, perhaps almost as narrowly as a man with a microscope might scrutinise the transient creatures that swarm and multiply in a drop of water. With infinite complacency men went to and fro over this globe about their little affairs, serene in their assurance of their empire over matter. It is possible that the infusoria under the microscope do the same. No one gave a thought to the older worlds of space as sources of human danger, or thought of them only to dismiss the idea of life upon them as impossible or improbable. It is curious to recall some of the mental habits of those departed days. At most terrestrial men fancied there might be other men upon Mars, perhaps inferior to themselves and ready to welcome a missionary enterprise. Yet across the gulf of space, minds that are to our minds as ours are to those of the beasts that perish, intellects vast and cool and unsympathetic, regarded this earth with envious eyes, and slowly and surely drew their plans against us." As opening lines of a science fiction story, that's up there with the very best. At once, the universe is made bigger - and mankind is made smaller, indeed turned infinitesimal, mere bacteria under a microscope. Wells' story was written in a time of achievement, a time of mankind's pride in its progress - something made clear through the story with its talk of great machines and construction by men, yet all of it rendered impotent in the face of the Martian menace. Faith in the pomp of man's ability rings through the opening sections of the novel. Life, despite the arrival of the Martians, carries on as normal for some time - disrupted only by the passing of military forces towards the location where the first cylinder lands. And then the tripods rise, and the destruction begins, and our central character is forced, like so many others, to take flight. As the futility becomes clear, the fighting that does take place becomes more important. The battle of the Thunderchild, an ironclad ship taking on Martian tripods, is at the heart of this, incredibly poignant. And when the Thunderchild dies, so too, it seems, does hope. As a youngster, this world seemed utterly realistic to me. The mundanity of the everyday was startlingly well depicted, feeling like you could touch it - and so when that started falling apart, there was a really tangible dimension to it. Over the years, I've seen both of the major movie adaptations - starting with the 1953 one which I sat up and watched on television at night with my mum, who loved scary movies but never wanted to watch them alone. I still think the 1953 one is superior to the later Spielberg and Tom Cruise movie - but neither really hits the mark. Neither truly captured the magnificence of the design of one of the great images in science fiction - the marching tripods, implacable, unstoppable. 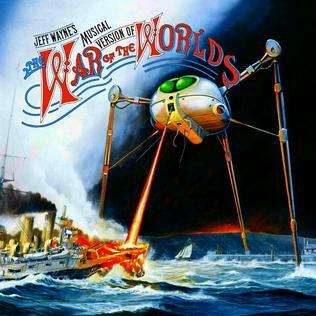 No, the best adaptation there has been is the magnificent Jeff Wayne musical version, with the voice of Richard Burton as the narrator, and the words sharply pared down to the leanest they can be, no word wasted, the rhythm and cadence of the words matching the apocalyptic music that surrounds them. But I still come back to the book that enchanted me in the first place. It isn't without flaw, there's armies of critics over the years who have pointed particularly towards its ending in that regard. And yet, when I pick it up, I'm simultaneously seven years old again and also lost in turn-of-the-century England... waiting... and watching... for a flare in the night sky, coming from Mars. If an author can still do that to me after all these years, then that book is something very special indeed. Leo McBride is the author of the Quartet short story collection, available here, and is featured in the fantasy short story anthology Tales From The Tavern, available here. He is also featured in the new horror short story anthology Tales From The Mists from Inklings Press. The latest anthology is available here. Finally, HG Wells has proven to be the inspiration for Leo's story The Secret War, available in Tales From Alternate Earths. You can follow him on Twitter under the handle @chippychatty.